Whether you are planning a reunion, wedding or other social event of the season, we pledge to make your event a successful one. Book one of our many unique banquet rooms for an event that you and your guests are sure to remember. Our planners and staff are here to assist in every detail not just in the planning phases but the day of the event as well. Look no further! The Capital Plaza Hotel would LOVE to roll out the red carpet for your group! 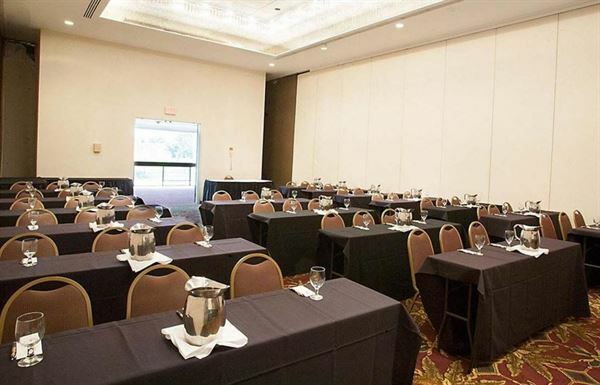 Pricing on meeting space: Ballroom $1500 Caucus room $500 KY Room $300 Seminar room $300. We can accommodate up to 375 people in our ballroom. We have smaller space that will accommodate 10-120 people. We can divide our ballroom into sections. Each section will accommodate up to 125 people depending on the set. The Round Barn is a lovely, historic location for special events located in the heart of Lexington. Offering a rustic but elegant atmosphere the Round Barn has a tremendous amount of character with its wooden beams, exposed brick, and a gorgeous chandelier running through the center. The facility will seat around 250-300 guests for a full dinner. The second floor may be used for cocktail hour, photo booth area, games and more. Facility rental for the Round Barn ranges from $2500-$3000. A little note about us :) We are focused on having the whole package here to make your wedding planning easy! Our facility rental includes tables, chairs, linen, set up and clean up. You have access to the space prior to your event to decorate and 6 hours of reception time. Bayou Bluegrass Catering is the exclusive food and alcoholic beverage provider for our venue. Located on Main Street in beautiful downtown Paris, this historic building has become one of Central Kentucky's premier event facilities. Located just 15 minutes from Lexington, Georgetown, Cynthiana and Winchester, this gorgeous facility has original hardwood floors, exposed 2 story brick walls, stained glass windows and a private balcony that overlooks the main ballroom. Up to 300 people can be accommodated and catering and decor options are endless. Evening and weekend appointment are welcome. Copper Roux is a great location for special events! The space offers a contemporary design with rustic elements inspired by all things Kentucky... bourbon and horses! Copper Roux is equipped with full?audio visual?capabilities, lovely custom bar area, and a great patio. The banquet area will accommodate 150-180 guests for a seated event.? Bayou Bluegrass Catering is the exclusive food and alcoholic beverage provider for our venues having a strong reputation for our unique and delicious menu selections and outstanding service. Whether you’re looking to host a small, intimate event or large gathering, our event sites provide a charming and distinguished setting for you and your guests. Surrounded by the Distillery’s distinct architecture and beautiful landscape, your event will be a unique and unforgettable experience. Set in the heart of horse country, hosting weddings and events for parties of 20 - 100 people, The Summer House is a charming location with a rustic, vintage setting. The indoor space features a very large stone fireplace and floor-to-ceiling windows. The intimate and elegant greenspace are perfect for photographs and our gorgeous, hand-laid stone pergola provides the perfect backdrop for any outdoor event. We will work with you to stylize The Summer House Venue so that it fits any vision you create. Let us show you why our venue should be your preferred event location in Central Kentucky. We are the best kept secret in Bourbon County!